The general temptation for investors to buy and sell at the wrong times repeatedly results in investor losses. As the markets near their all-time highs, investors are wading back into the markets. Since the December swoon, most investors have forgotten the pain they felt, and the "fear of losing" has once again been replaced with the "Fear of Missing Out." This past weekend, Tiger Woods completed a comeback on Sunday by capturing his fifth Master's title and his 15th major tournament win. It was a victory that snapped a decade-long championship drought and instantly returned him to the top of the sports world. While his drives were some of the best on display, it was his final two-putt, likely the greatest bogey of his career, which put him 13-under par clinching the title. Yes, Tiger Woods is back at "all-time" highs. However, Tiger Woods' journey back to the peak of the golfing world after being outside of the top 1000 in 2017 is not only a major accomplishment but a story of tragedy along the way. Many wrote off Woods' career as the injuries took their toll on his form, world ranking, and quality of life, along with a high-profile divorce, a bit of a scandal, and personal issues. However, despite the odds, Tiger Woods is back with a story that the world had resigned itself to never seeing again. In many ways, investors over the last decade have endured much the same. Investors were on top of the game in 1999, as the markets soared higher. There seemed to be nothing that could stop the advance despite high valuations and questionable accounting metrics. 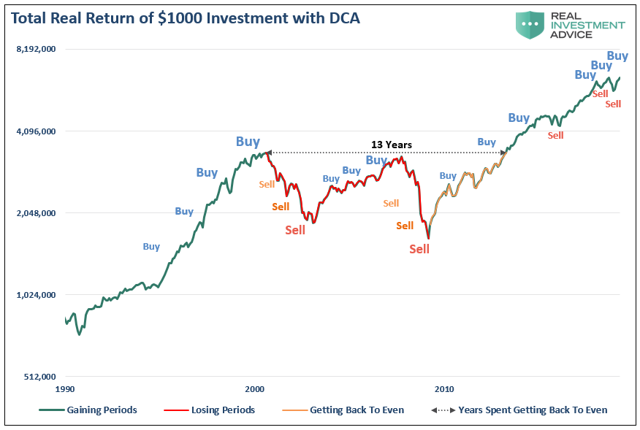 However, after 13 years in the "investment wasteland," investors finally got back to even had they held onto their S&P index fund and religiously dollar-cost averaged (DCA) into it. Unfortunately, there were very few who did. As repeated studies have shown, while "buy and hold" investing sounds like a workable plan, the fallacies of "being human" tend to deviate it from our goals. For Tiger Woods, it was his human frailties, both physically and emotionally, which deviated him from his dominance in golf. For investors, it is much the same as our emotions of "greed" and "fear" destroy the best laid of plans. 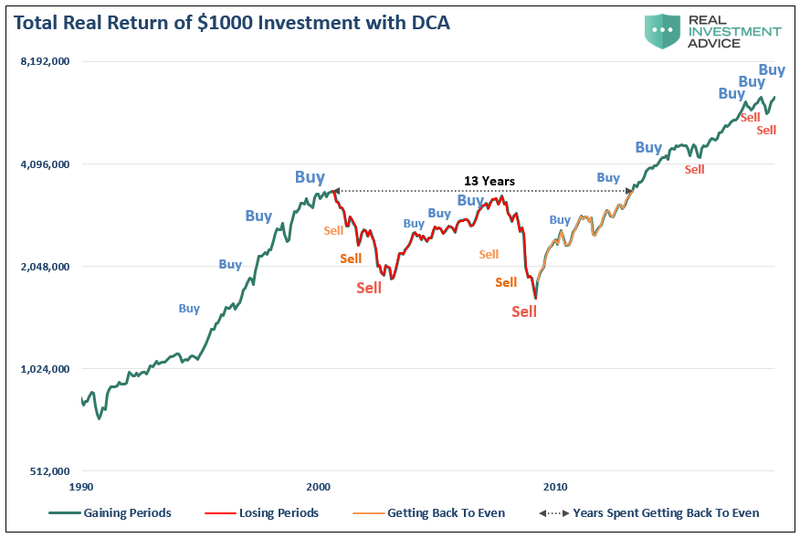 "Many investors are finally getting back to even, assuming you didn't 'sell the bottom' in December, which by looking at allocation changes, certainly appears to be the case for many." "Not surprisingly, historically speaking, investors had their peak stock exposure before the market cycle peaks. As the market had its first stumble, investors sold. When the market bounces, investors are initially reluctant to chase it. 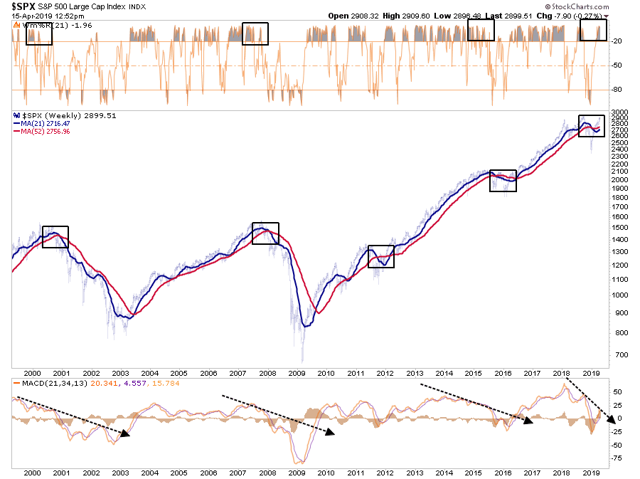 However, as the rally continues, the 'fear of missing out or F.O.M.O' eventually forces them back into the market. This is how bear market rallies work; they inflict the most pain possible on investors both on the bounce and then on the way back down." "But individual investors are once again wading into the market, indicating renewed bullishness in surveys and flow data released in recent days. The latest E-Trade StreetWise survey, released Friday, showed 58% self-directed investors calling themselves 'bullish' on the stock market in the second quarter of this year, a 12 percentage-point increase from the first quarter, when a 54% majority indicated they were 'bearish' in their stock market outlook." The most exciting part of golf is watching the Pro's "drive for show." A hushed silence falls over the crowd as the golfer looks down the fairway at the distant flag. You can almost hear the breathing stop as the backswing begins. The camera chases the ball as it flies through the air as the excitement builds that it will land on the green. It is the same with investors. With all eyes focused on the market as it flies higher, it's exhilarating. Currently, with markets rising on hopes the Federal Reserve is returning to more "accommodative" ways and consistent headlines of a conclusion to "Trump's Trade War," there seems to be nothing that can stop the market's advance. "Hope" is an incredibly virulent toxin that blocks the "logic pathways" of investor intellect. One of the clues of its presence is the belief that "this time is different." However, it is when the "ball lands on the green" that the real work begins. The most challenging aspect of golf, and where it counts the most, is minimizing the number of strokes required to "putt" the ball into the cup. Those most skilled are the ones who win more often than not. In investing, it is much the same. As markets approach major important inflection points, it is the skill of mitigating risk and repositioning portfolios which reduces the number of "strokes" in the investment game. Since the December swoon, most investors have forgotten the pain they felt, and the "fear of losing" has once again been replaced with the "Fear of Missing Out." However, while many investors spent their time "driving for show," bond investors won by consistently "putting for dough." 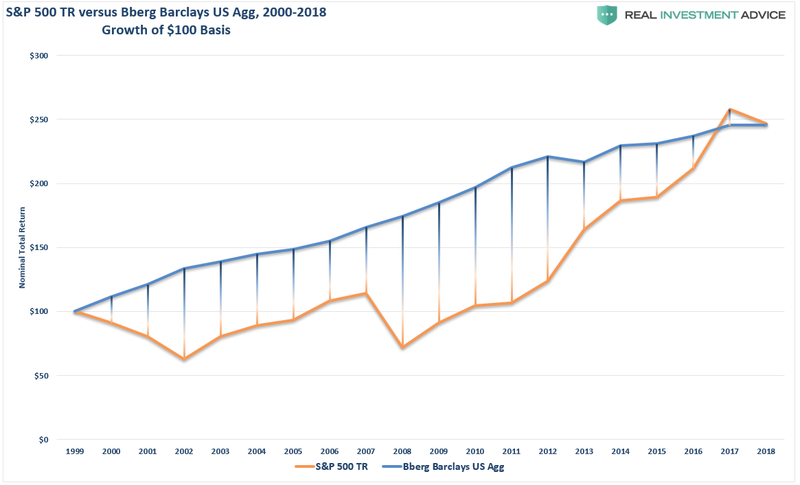 Currently, the market is as extended as it has been at other major points throughout history with a similar backdrop of slowing earnings and economic growth, higher interest rates, and geopolitical stresses. Also, complacency is back as volatility continues to subside, as the "fear of a correction" has subsided substantially since the December lows. Clearly, the "drive for show" is now behind us. As we prepare for the "putt," it is time to focus on the "lay of the green." 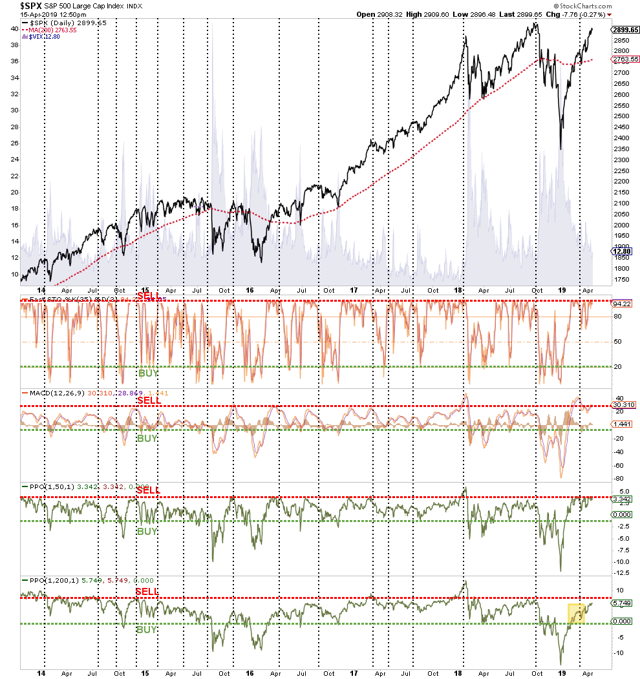 In the short term, the market remains bullishly biased and suggests, with a couple of months to go in the "seasonally strong" period of the year, that downside risk remains limited. Importantly, while downside risks are somewhat limited, this doesn't mean there is a tremendous amount of upside reward either. In your own portfolio, there are simple actions you can take to improve your chances of "sinking the putt." Trim positions that are big winners in your portfolio back to their original portfolio weightings (i.e., take profits). Sell underperforming positions. If a position hasn't performed during the rally over the last three months, it is weak for a reason and will likely lead the decline on the way down. Look to reposition portfolio composition from "risk" toward "safety." Look to reduce assets specifically tied to economic growth, and increase holdings in assets which tend to be more defensive in nature. If you just don't know what to do, cash is the best alternative. 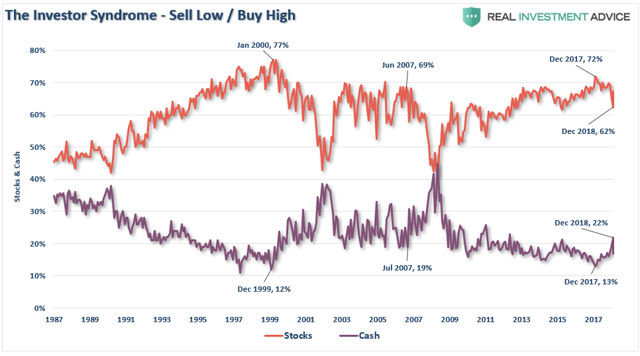 With cash now yielding more than the S&P 500, holding cash is an option until you figure out what to do. Remember, investing is about making a bet where the potential for reward outweighs the risk of loss. If you can't find that opportunity right now, cash is the best alternative until you do.